Experience the unique environment that the UK mountains offer in winter. This activity aims to guide your group safely through this extreme environment and to only teach the essential skills giving a ‘guided’ experience, for courses offering more technical winter instruction and guiding see the links below. We offer this activity only as a full day option, it can be a shortened day if required but usually will not allow time for another full activity. That said, when the snow cover in the chosen area is extensive we may be able to create a bespoke day for your group including another activity. See our Blog for current winter conditions. We generally run our winter courses in Scotland, but if the winter conditions are good in the Lake District then we are always keen to use the area as well as there are some great local options. We are very flexible and mobile with this service. 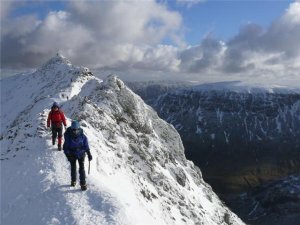 Note – for winter navigation instruction see Winter Navigation and for instruction in a range of winter walking mountain skills see our Winter Walking Skills course. We also offer a range of courses tackling more technical ground in winter, see Winter Courses.